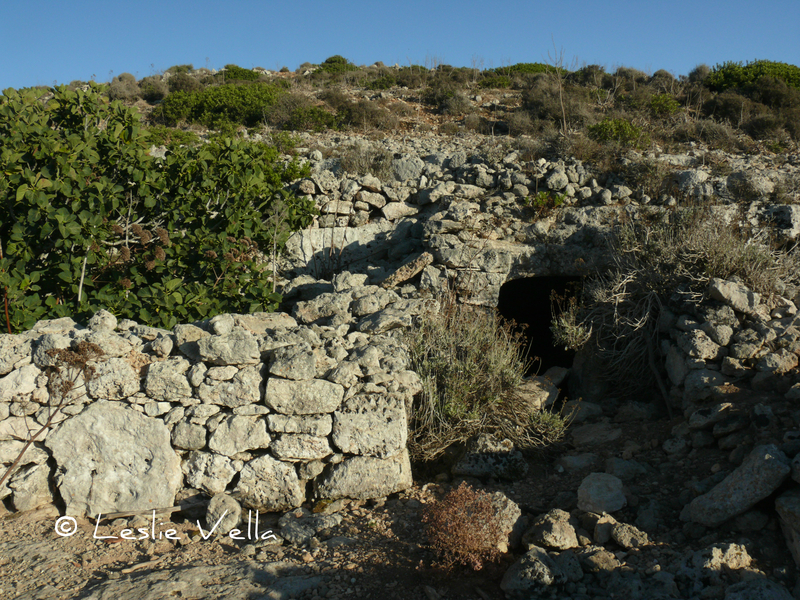 Ghar il-Hamrija: A medieval troglodyte chapel on Comino. The more I visit Comino the more I deeply fall in love with it. And the more I explore its bare, rugged, windswept terrain, the more I appreciate its rich history and diversity. A history spanning millennia of human presence and activity on a 2.5 square kilometre island with limited agricultural land and even more limited water resources. Archaeological evidence of humanity’s past presence on this tiny island is generally sparse although plentiful enough to indicate a continuous presence over most of the past twenty five centuries. 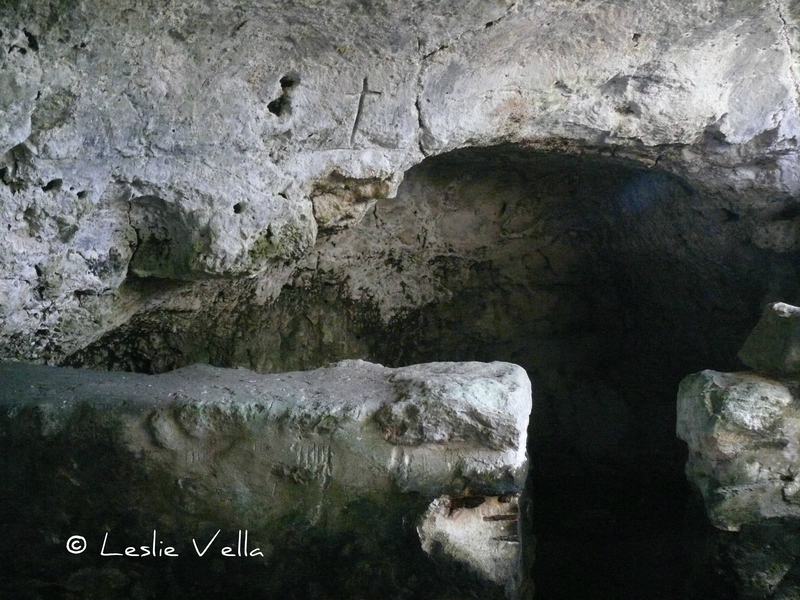 Ancient burial sites on the island suggest both a Punic and a Roman presence. Pottery sherds, oil lamps, glass fragments, water channels, lead anchors and ancient coins unearthed over the past few hundred years also lend further support to some sort of permanent human activity on Comino since Antiquity. However, when compared to its two larger siblings Malta and Gozo, the one historical footprint which is immediately lacking on Comino pertains to the lack of ancient structures. In the past this was interpreted as evidence that the island was never really populated and that any sort of human activity across the centuries was either of a very short term nature, or else that the island was farmed by people crossing over from Malta and Gozo on a seasonal basis and living in temporary abodes. The counter argument to this lies in Comino’s geology. For contrary to its two larger neighbours, with their abundant stocks of soft globigerina building stone, Comino is composed entirely of Upper Coralline Limestone: a much harder, rougher and less easy stone to quarry and build with. This implies that given the scarcity of building material on this small island, there must have been a much more common tendency to recycle and re-use masonry rather than simply extract new blocks as happened on Malta and Gozo. One of the more permanent survivors of past human activity across the ages generally relates to places of worship. Such places were usually designed to achieve prominence and permanence and are usually some of the few things to survive the passage of time. Some even survived invasions and changes of faith. 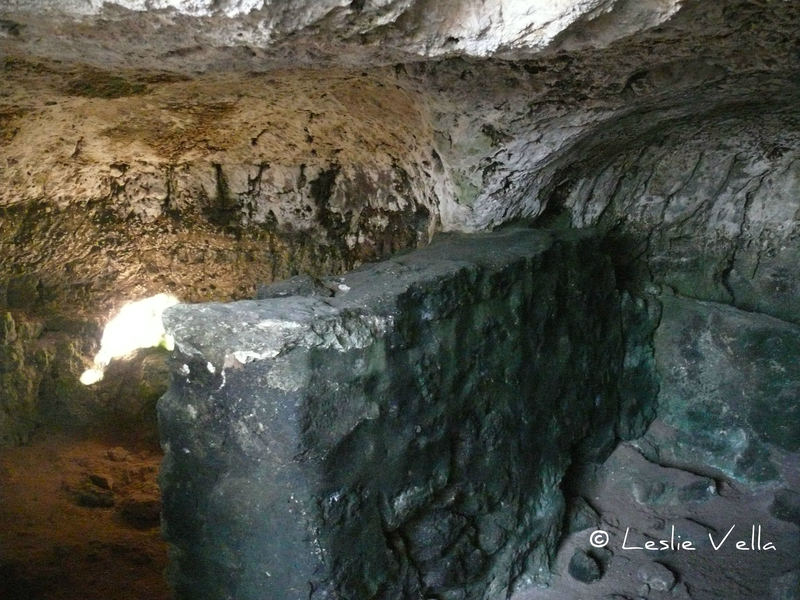 The site at Tas-Silg in Marsaxlokk started off as a prehistoric temple dedicated to the Earth Mother and was subsequently adapted and reused as a temple by worshippers from the Bronze Age, the Phoenicians, the Carthaginians, the Romans and finally the early Christians. Similarly a structure at Is-Simblija, limits of Dingli, probably started off as a mosque and was eventually converted into a small medieval chapel prior to losing context and significance and ending up as a farmyard building after the estate fell into disuse. Back to Comino! The most prominent religious structure on Comino is the Christian church dedicated to the Holy Family on the Flight to Egypt. The current structure was built in 1618 and was subsequently enlarged in two different phases in 1667 and 1716. There are however medieval references to a place of Christian worship on Comino in a 1296 text which I am tentatively associating with the Carta Pisana portolan. 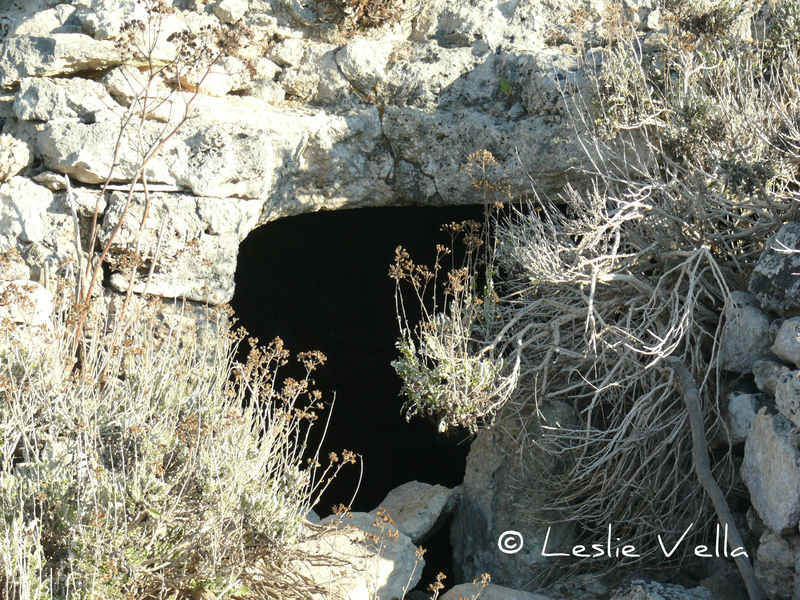 Some time ago I encountered an academic paper by Keith Buhagiar which made reference to two man-made caves dug into an area of high ground in the central part of Comino. The area was once a quarry and commands a good view of the fertile fields of Wied l-Ahmar and Wied Imdied all the way down to the inlet of il-Kola which was most likely Comino’s next best alternative to a miniature harbour in ancient times. During my latest visit to Comino with my wife this summer, we made it a point to seek these caves and see them for ourselves! 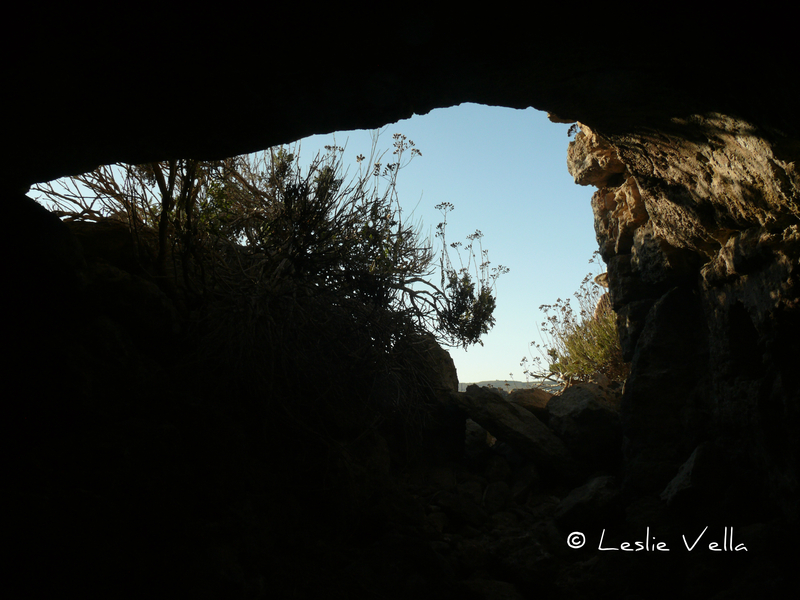 We found the cave complex in an area off one of the footpaths linking the two valleys. They lie in an area surrounded by the crumbling remains of a dry-stone wall enclosure. 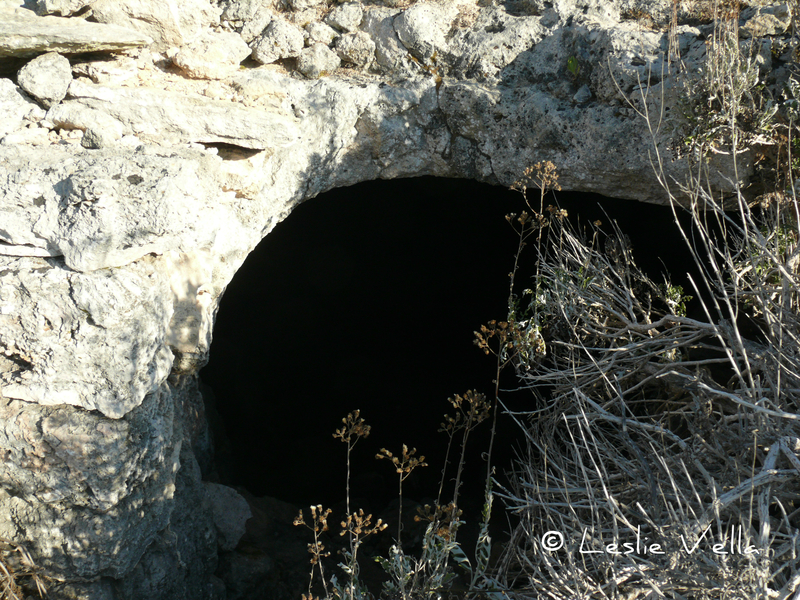 One of the cave entrances was very visible while the other smaller cave is totally enveloped by a huge fig tree rendering access to it impossible. The larger cave, known as Ghar il-Hamrija or the Cave of Soil is easily accessible down a rough stone ramp through a low doorway and its interior floor level is about one metre lower than the ground outside. 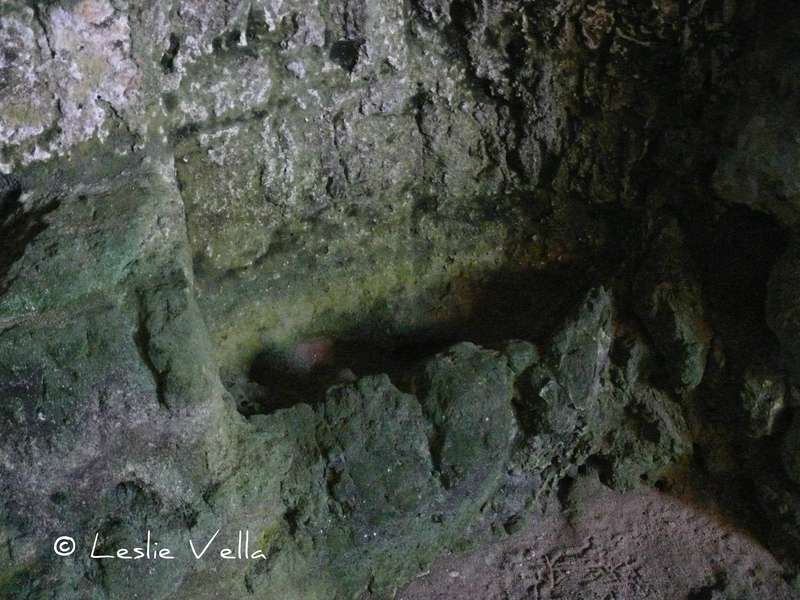 The floor of the cave has a thick, soft and damp layer of the terrarossa soil prevailing on Comino giving the cave its name. 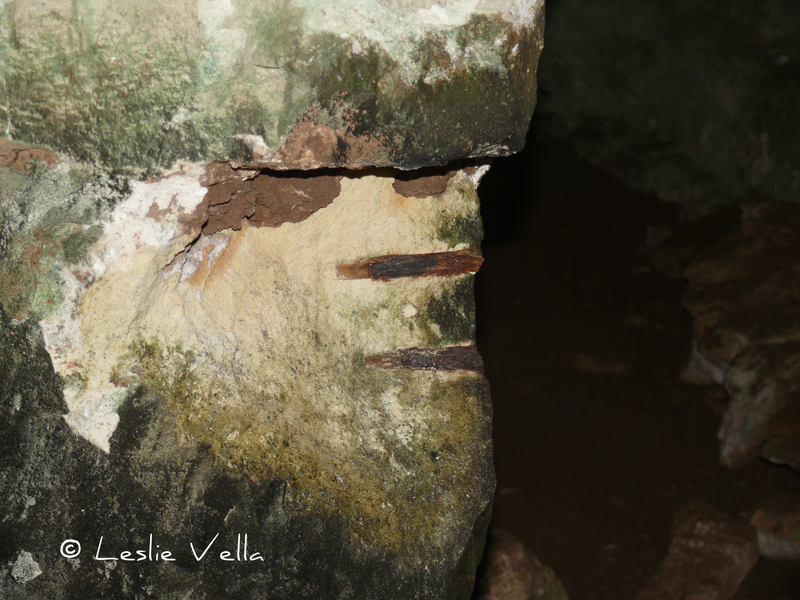 According to experts who have surveyed the cave, the existence of different and distinct types of toolmarks in its interior indicate that the original smaller cave was enlarged at an unknown date. 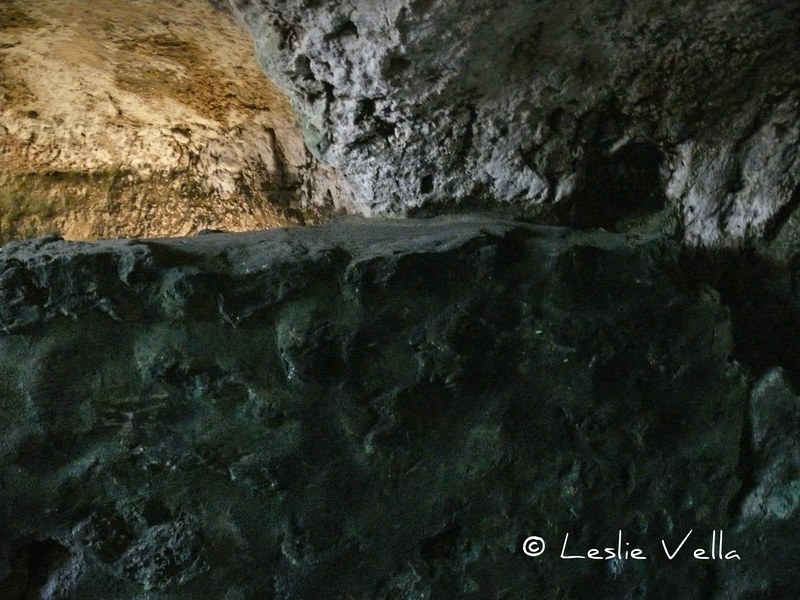 The cave’s roof is probably the only surviving part of the original chamber and provides evidence that the original cave was oval in shape with a barrel shaped ceiling which was well-finished. 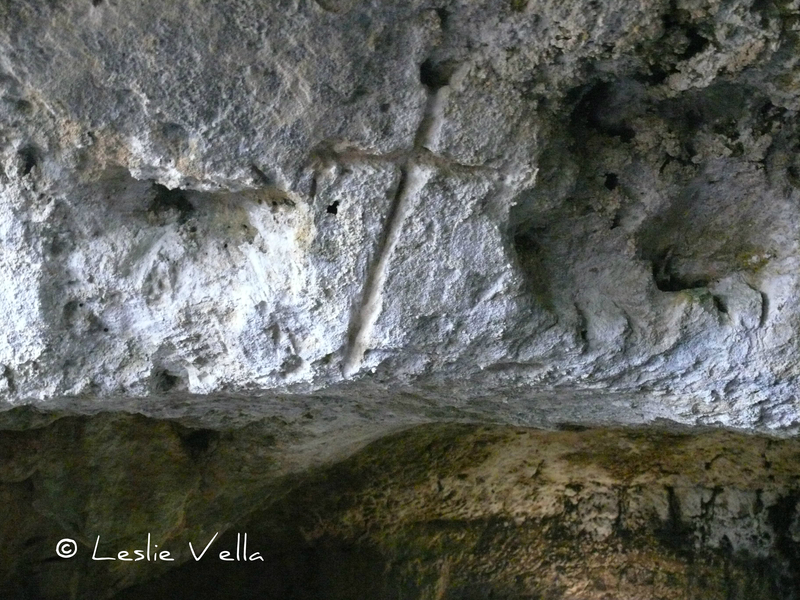 Three Latin-type crosses are carved on three sides of the ceiling, while the faint remains of a straight decorative band of receded rock which seems to have circled the entire cave below the barrel-vaulted ceiling are still discernible. 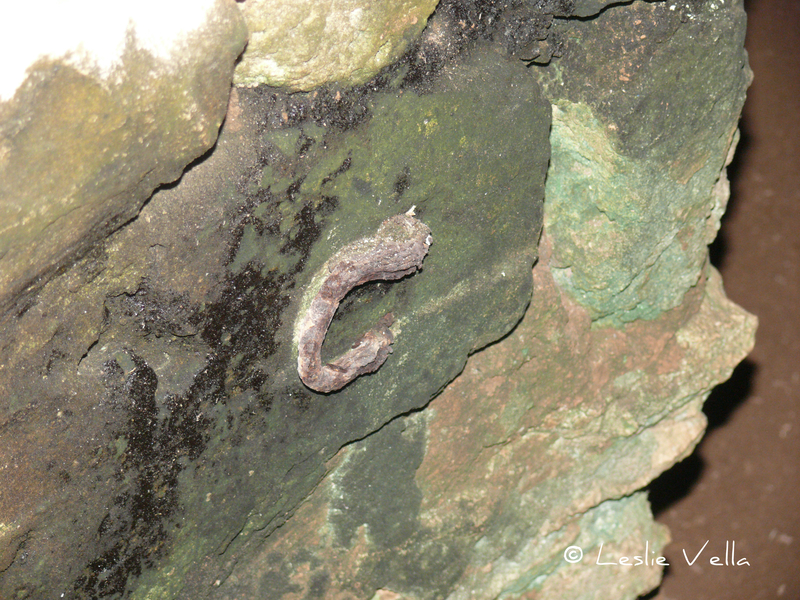 This oldest part of the cave gives the impression of a long history. Its vantage-point location on the high ground overlooking fertile fields, its plan and the level of refinement suggests that it was not hewn out of the living rock simply as an agricultural structure. 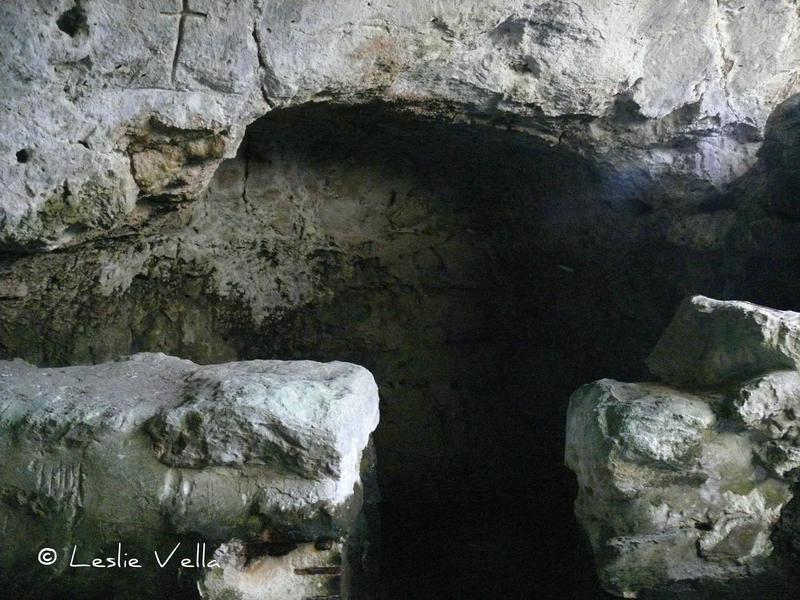 Rather, the evidence strongly suggests that its original purpose may have been to serve as a rural cave-church of which there are still a few surviving examples scattered across the Maltese Islands. One of its nearest neighbours is the cave-church of St. Nicholas in nearby Mellieha on mainland Malta which I am yet to visit. Such churches were built to service the spiritual needs of scattered and isolated rural communities and their relative refinement serves to distinguish them from other troglodytic structures such as cave dwellings and animal pens. 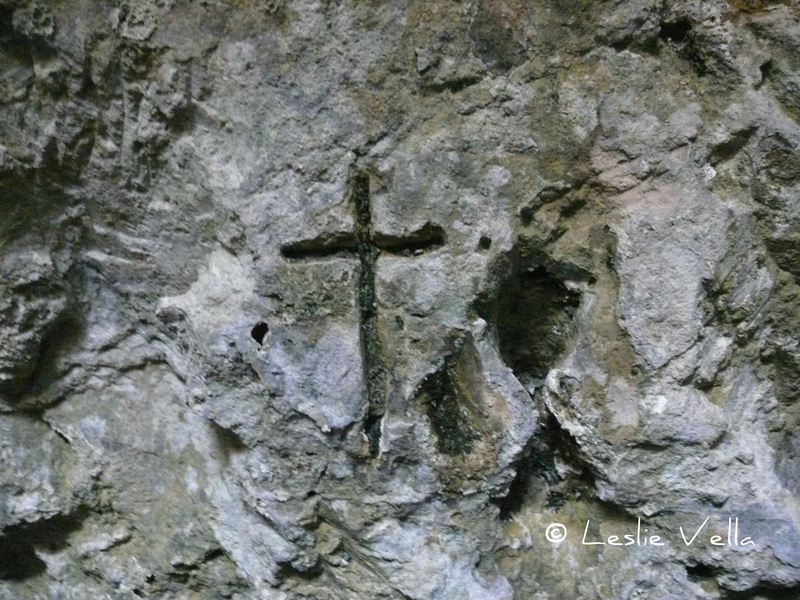 At this point, the question I ask as a layman is, could this cave-chapel be the one referred to in the 1296 text? I would argue that it most probably is, as it would not have been logical to have two contemporary places of worship within a few hundred metres of each other on a small island like Comino. 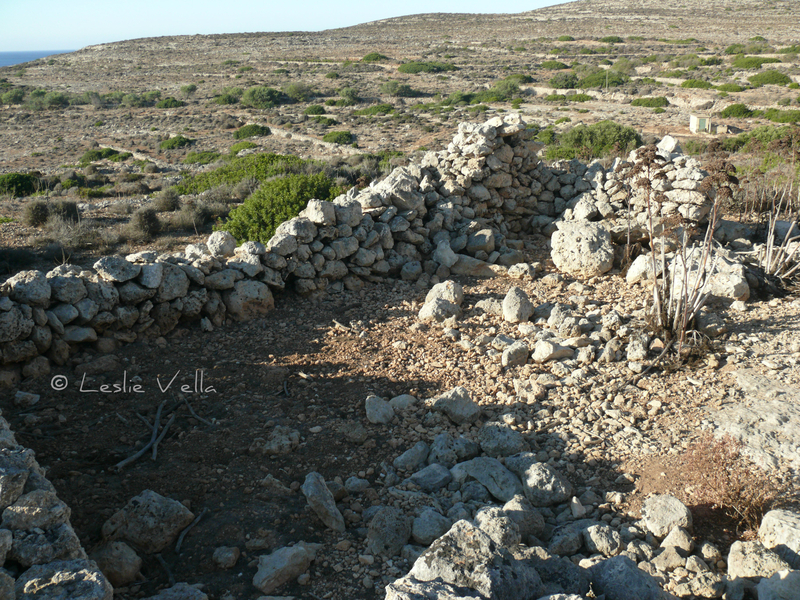 In my opinion, Ghar il-Hamrija may well be Comino’s original Christian church referred to in 1296 until it was subsequently replaced by the more elaborate surface structure built in 1618 at the mouth of Wied Imdied which still stands as Comino’s chapel today. Later additions and alterations to Ghar il-Hamrija expanded it into three separate chambers which are today subdivided by dry-stone walls. The remains of gates, locks and feeding troughs all suggest a more recent use as an animal pen. A blocked circular shaft in the roof near the doorway could have either been a ventilation hole for smoke dispersal or else a hole through which animal manure from the pens could be extracted for dispersal in the fields. Ghar il-Hamrija is one of those special places which can either kindle a flame of respect and interest for the rich history of a small island like Comino or otherwise leave you cold, to be dismissed as a mere damp hole in the rock. It has survived the ravages of hundreds of years and lies there today: a relatively hidden and unknown testament to ancestors of ours who lived in a much smaller, unprepossessing and simple world so different from the madness prevailing in our time. 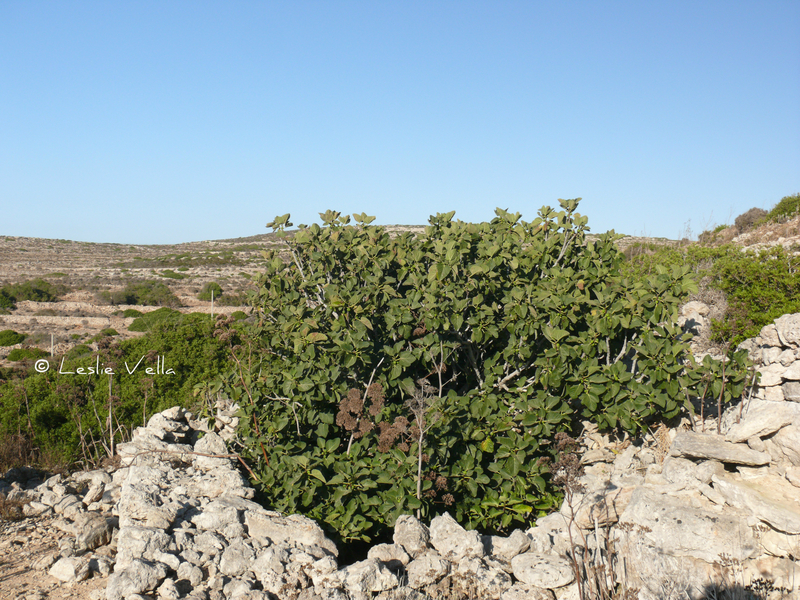 To me it provided an experience which bound me even closer to tiny Comino!